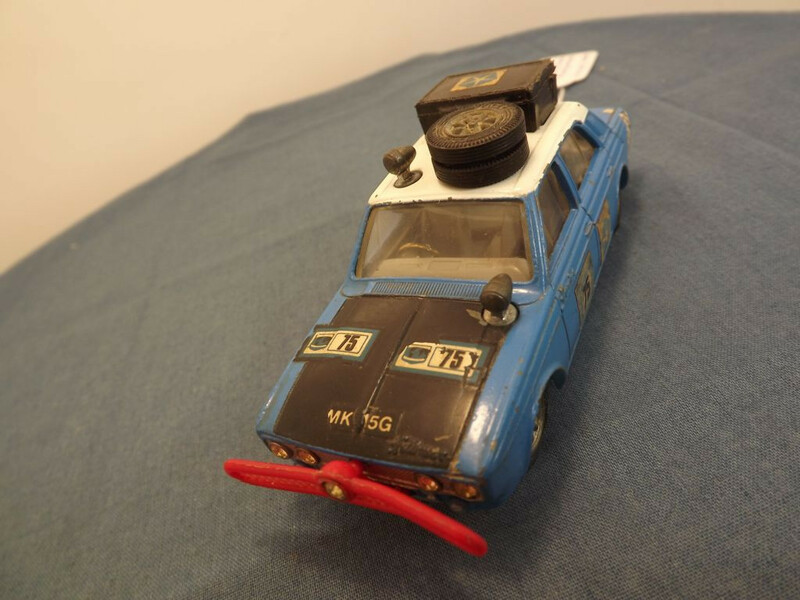 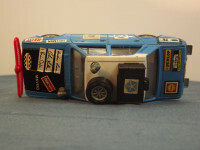 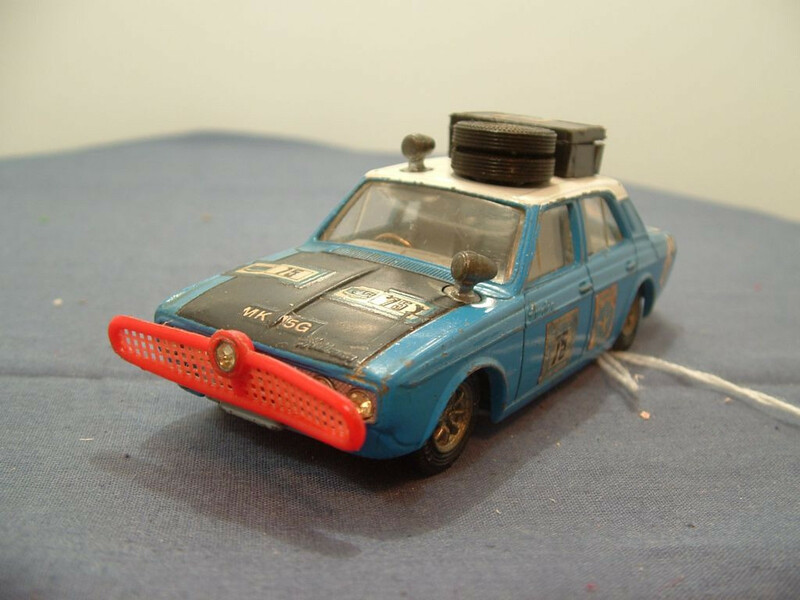 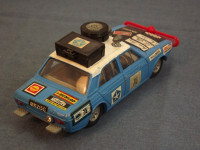 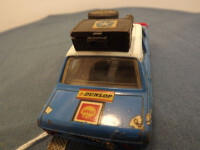 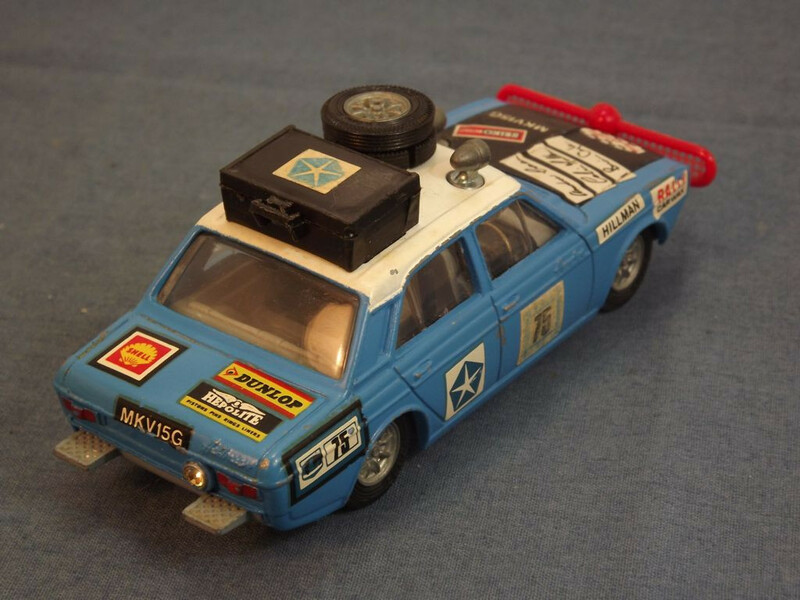 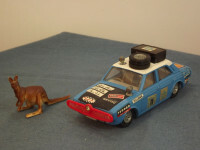 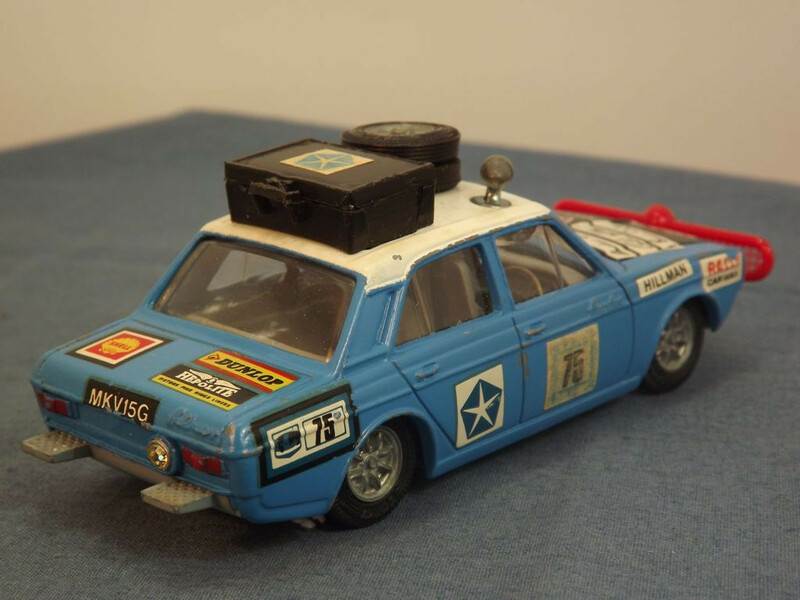 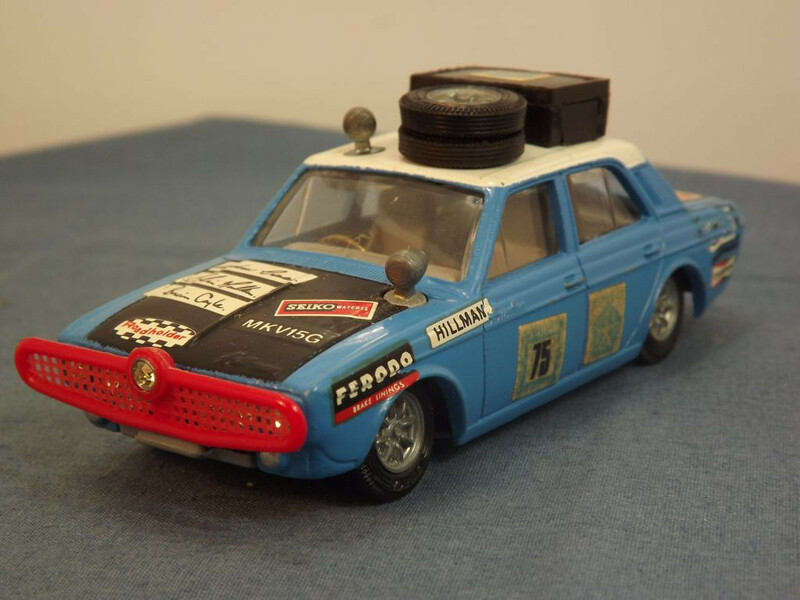 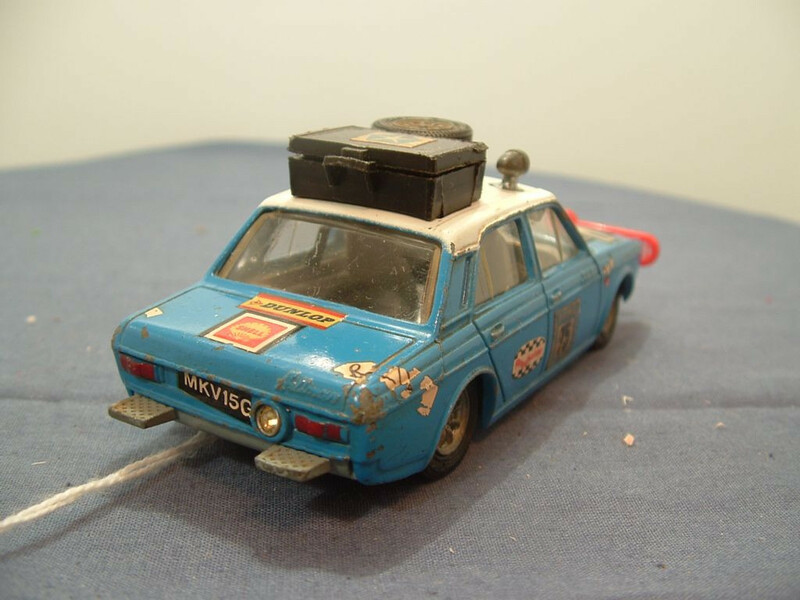 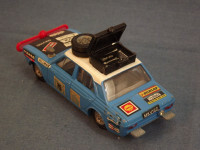 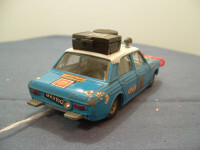 This model is the Corgi 302-B-1 Hillman Hunter in Blue, White and Black, Rootes Group livery as driven in the 1968 London to Sydney Marathon. It comes with a brown plastic kangaroo. 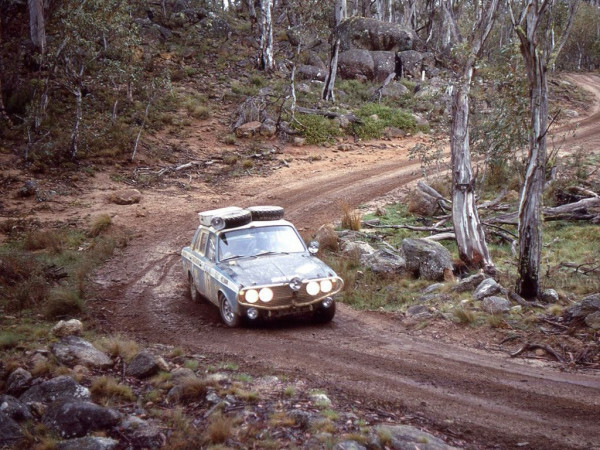 At the bottom of this page is a photo taken by Bruce Thomas of Perth, West Australia of the real Hillman in action. 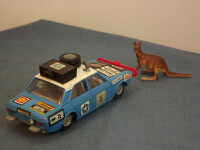 I haven't been able to contact Bruce for permission to use his photo so I have attributed it to him as per Wiki Commons guidelines and Bruce, if you ever find this page can I have confirmed permission to use the photo? 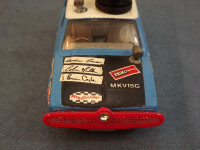 More of Bruce's photos can be found at this site together with links to some of Bruce's other photos. 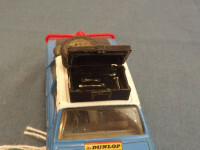 The interior is all grey plastic with a right hand drive, gold metal steering wheel inserted into the grey plastic dashboard (instrument panel). 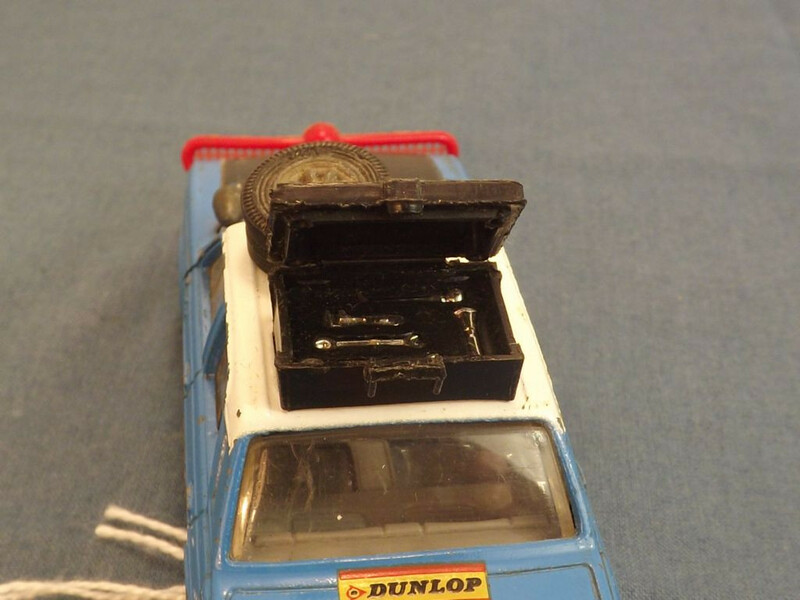 The glazing is clear all round. 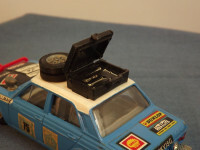 All wheels are of the "Golden Jack" type - solid one piece cast metal with a "bare metal", 8 spoke patterned "hub" in the center. 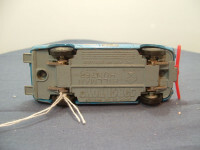 By moving the jack lever, the wheels are able to be taken off. 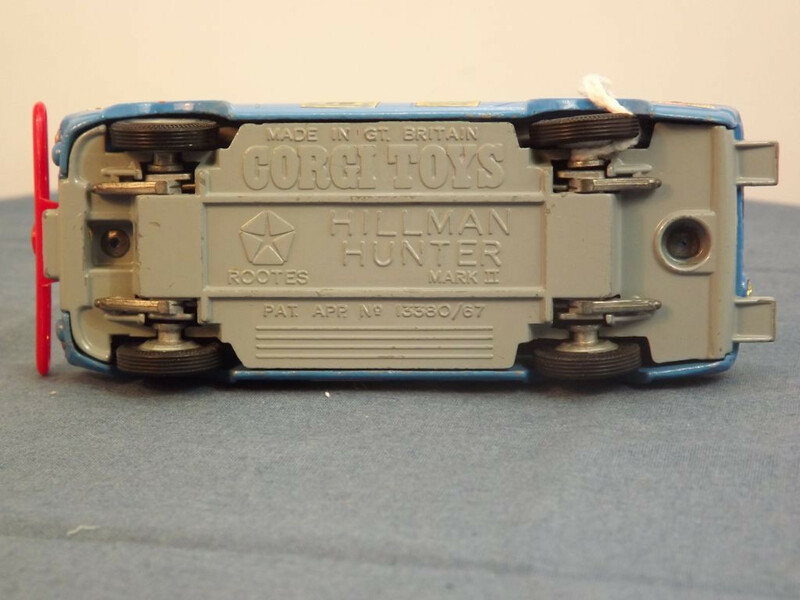 The base plate is grey painted metal and is marked with "Made in GT Britain", Corgi Toys in the top centre, "Hillman Hunter Mk II" and the Rootes Group logo in the middle centre, and "PAT.APP.13380/67" at the bottom centre. 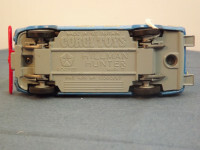 It is held in place with two machined rivets. 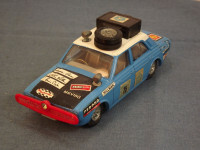 This model 302 was issued between July 1969 and 1972. 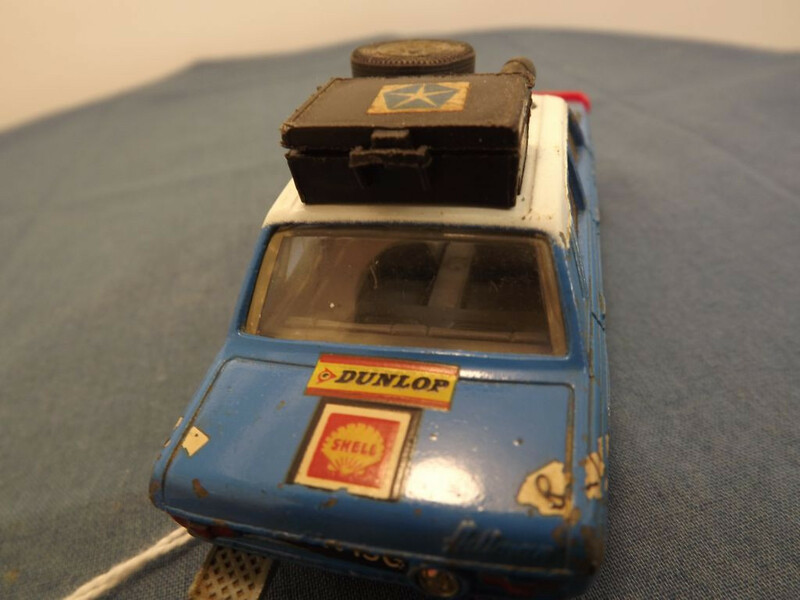 Its scale was said to be 1:45. 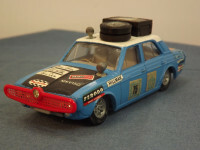 This model is the Corgi 302-B-1 Hillman Hunter in Blue, White and Black, Rootes Group livery as driven in the 1968 London to Sydney Marathon. It originally came with a brown plastic kangaroo (now missing). At the bottom of this page is a photo taken by Bruce Thomas of Perth, West Australia of the real Hillman in action. 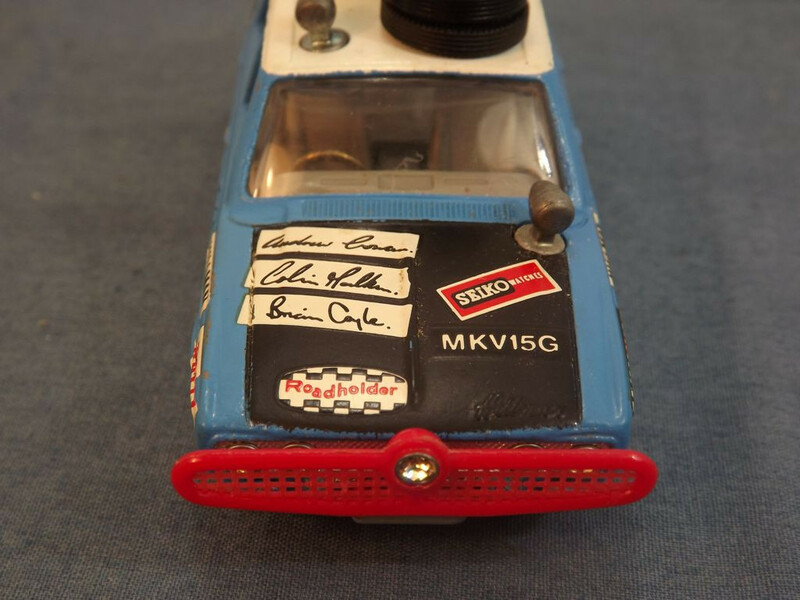 I haven't been able to contact Bruce for permission to use his photo so I have attributed it to him as per Wiki Commons guidelines and Bruce, if you ever find this page can I have confirmed permission to use the photo? More of Bruce's photos can be found at this site together with links to some of Bruce's other photos.